gazing As things begin to heat up on the political front, it would seem apropos to do a little navel gazing, to try and figure out just where each of our main electoral choices seem to be headed. 2003 is a year where we shall be blessed with three leadership conventions among the five main federal parties, while one tries to expand out of its region as another tries to remain relevant within its territory. hand The wringing of hands begins this Friday in Toronto as the New Democratic Party seeks not only a successor to Alexa McDonough, but also renewal and a return to relevance. Regardless as to who claims the ring this weekend, be it Toronto civic politician Jack Layton or veteran Saskatchewan MP Lorne Nystrom, the new leader will have to be able to combine social conscience with some responsible fiscal tenets. If that person wishes to reallocate our tax dollars from corporate to social restructuring, to seek to replace handouts with a helping hand that might allow some a chance at self sufficiency, I'm willing to listen. If they wish to raid my beleaguered wallet any further, then they can go to hell. If the NDP has any hope of rising from its electoral purgatory, its needs to project some realistic ambitions that are both achievable and desirable among those with similar community convictions. one What one could say about the Liberals has been, no doubt, said already, albeit often in a fashion that prevents me from repeating them here. With the well deserved retirement of Prime Minister Jean Chretien, at least well deserved by an ever suffering populace and even a party that has had more than enough of his kind of "leadership," there is hope that the man who would be king might provide the Midas touch. 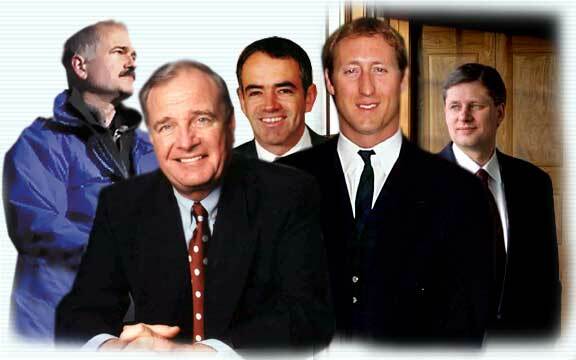 When delegates gather in Toronto this November, Paul Martin is expected to claim a first ballot victory. The ex-Finance Minister has long been dubbed the "anointed one" since he lost the leadership battle in 1990, as was Jean Chretien before him in 1984, as was John Turner when he quit Pierre Trudeau's cabinet in 1975. Sadly, none proved worth the wait. With 80% of his Liberal seats attributable to central Canada, Trudeau's own vision of Canada did not seem to go much beyond Ontario and Quebec, except for those few rustic spots where he could paddle his canoe. sleeping For the Bloc Québécois, it's vision of nationhood only extends beyond its provincial border with the crossing of the river from Hull by its MP's on their way to Parliament. Leader Gilles Duceppe isn't going anywhere just yet, though the same can not be said about MP Pierre Brien, who announced last week that he was leaving the B.Q. to run for Mario Dumont's A.D.Q. in the next Quebec election. While time will tell how the A.D.Q. might differ from the openly separatist Parti Québécois in future, provincial politics is where the power resides for those who seek to yank their province out of confederation. Brien's leaving should not much affect the B.Q as, at best, it merely represents the voice of the separatist cause in Ottawa, dangerous only if put in a position of power through its support of a minority government. While the provincial P.Q. 's own electoral fate seems perilous as they head to the polls before this year is out, I fail to see how one can summarily dismiss any party or its cause for long if it can manage to retain even 20% of the popular vote. Does anyone really think the separatist threat is truly over in Quebec? Does anyone want to kick the dragon to see if it is really dead or merely sleeping? chap The Progressive Conservatives would love to attract 20% of the popular vote, something they have failed to do since the 1988 election. Joe Clark, who more than twenty years ago served as our Prime Minister for 273 days, is leaving a job the likes of New Brunswick Premier Bernard Lord, ex-Ontario premier Mike Harris, and former general Lewis Mackenzie couldn't be bothered with. The early line is on 37-year old Nova Scotia MP Peter McKay taking the prize late this spring, an affable enough chap though one wonders if he has the right stuff to return the P.C.P.C. to its former glory. Some may not think he is his party's next Brian Mulroney, which might be a good thing considering Mulroney's legacy included not only two majority governments but also the magic trick of pulling two additional political parties out of a hat at the expense of his own. now quiet Then there is the Canadian Alliance, as the coalition of western democrats and conservatives seems downright tame compared to the circus act they presented under their self described "big tent" since Reform began to conform only to end up somewhat deformed. With Stephen Harper's election as leader last year, the party has been, at worst, quiet. It has internalized its debt with more friendly creditors, its own constituency associations, while seeking to properly prepare itself as a credible alternative to the Liberals in the next election. Yet, one question remains. Can the Canadian Alliance become attractive to voters in central and Atlantic Canada without betraying the founding hopes of its western supporters, just as the Progressive Conservatives were seen as doing? separatism In the Canadian Alliance heartland, some are considering abandoning federal politics in search of a provincial champion that will go toe-to-toe with Ottawa in their defense, willing to do whatever it might take to succeed. Don't you find it interesting how many ways that word, succeed, can be defined? We've seen, in recent years, the advent of the Alberta First and Alberta Independence parties, while the Alberta Alliance rises next month with its founding convention. This fall, there are rumblings that a gathering of discontented Albertans may be brought together to discuss the province's future, more than a little reminiscent of the1986 gathering of western Canadians that led to the formation of the Reform Party. Should such a gathering attract the right people, with those not interested in power establishing a democratic foundation in preparation for those who are, then Canadian politics in 2003 could prove to be very interesting indeed.